It is widely known that iTunes M4B Audiobook offers you great enjoyment and becomes more and more popular with Apple users as well as other users. However, it is DRM-protected so that you can only enjoy it with Apple devices. When you bought some interesting Audiobooks on iTunes and you want to play it on your non-Apple mobile devices, you will find that it cannot work at all. And AAC is usually used and widely supported for these devices. To convert DRM-protected iTunes Audiobooks to AAC with the available audiobook converters will make it simple and compatible for non-Apple devices to play iTunes Audiobook then. And Leawo TunesCopy Ultimate would definitely be one of the most powerful iTunes DRM audiobook converter. Leawo TunesCopy Ultimate is a powerful and professional iTunes DRM removal program and a DRM media converter. It can not only allow you to remove DRM from iTunes video, music and audiobook purchased or rented but also help you convert those iTunes encrypted M4V video files to MP4, or iTunes M4B/M4P music and audiobook files to MP3 so that you can play iTunes files on ordinary media players or mobile devices. To convert DRM-protected iTunes Audiobooks to AAC, you should absolutely use this program to save the M4B file as MP3 audio file at first. Furthermore, it works easily and quickly surpassing any similar programs. In order to convert DRM-protected iTunes Audiobooks to AAC, you should download and install Leawo TunesCopy Ultimate at the beginning, and then you launch it to enter the main interface and make it work. Besides, before you convert iTunes audiobook to AAC, what you should note is that you are required to authorize the computer by signing in with your Apple ID to play the M4B audiobook file purchased or rented, and you are not allowed to open iTunes during the iTunes DRM removal process. In the main interface of Leawo TunesCopy Ultimate, there are “Add Files” button in the sub-menu bar and middle interface, you can click any one of them to add the M4B audiobook. Or you can directly drag and drop the target iTunes audiobook files to the middle of program interface. 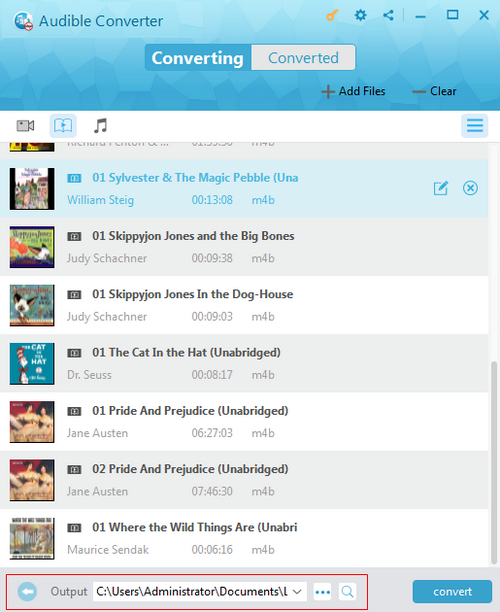 When the audiobooks are added to the program, you can view the M4B files under the category “audiobook”. Next, you can choose an M4B file and click the “edit” button to freely choose Channels, Sampling Rates and Bit Rates for the output MP3 audio file. STEP 3: Set Directory for the Output MP3 file. In the “Home” list, you can see the Output box where you can set the directory path for saving the output MP3 file. Once finishing all the settings, you click the blue “Convert” button at the bottom to start removing DRM from the iTunes M4B file and converting the audiobook to MP3. And you can make it with iTunes DRM removal and conversion program in minutes. Note: Before converting the audiobook, you will be asked to authorize the computer for playing the iTunes audiobook if you have not authorized the computer yet. When the conversion is done, you can check all the converted files by entering the Converted interface and you can open the output MP3 file. Or you can find the MP3 files with the searching bar at the bottom. Now since you have removed DRM from iTunes Audiobooks and converted the iTunes audiobook to the common MP3 files, you can easily convert iTunes audiobook to AAC with Leawo Video Converter which is the professional tool designed for converting video and audio formats to the common formats you need. 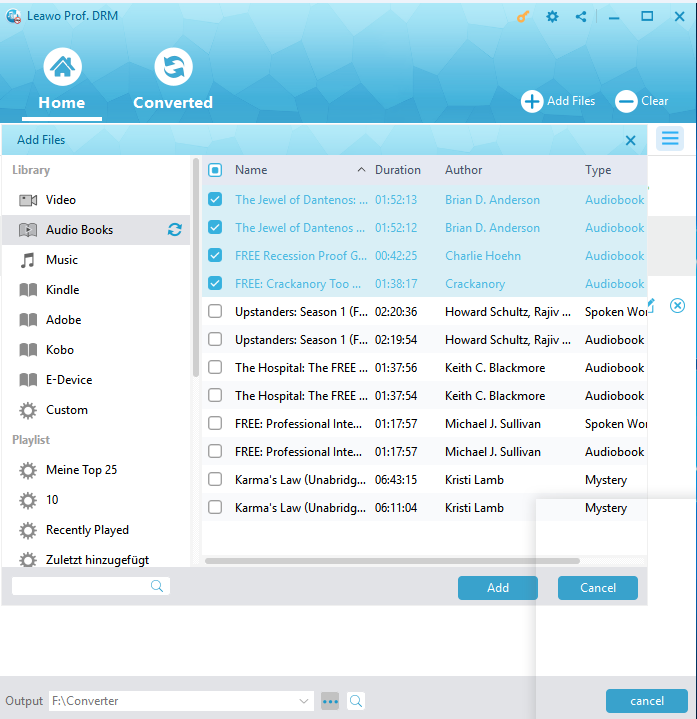 Leawo Video Converter is also a great media converter that will be useful and necessary to convert DRM-protected iTunes Audiobooks to AAC, which works in 6X Faster Speed and keep 1:1 quality while converting videos and audios in over 180 formats from one to another. Besides, it works in simple steps and easy for you to use even if you are a green hand. 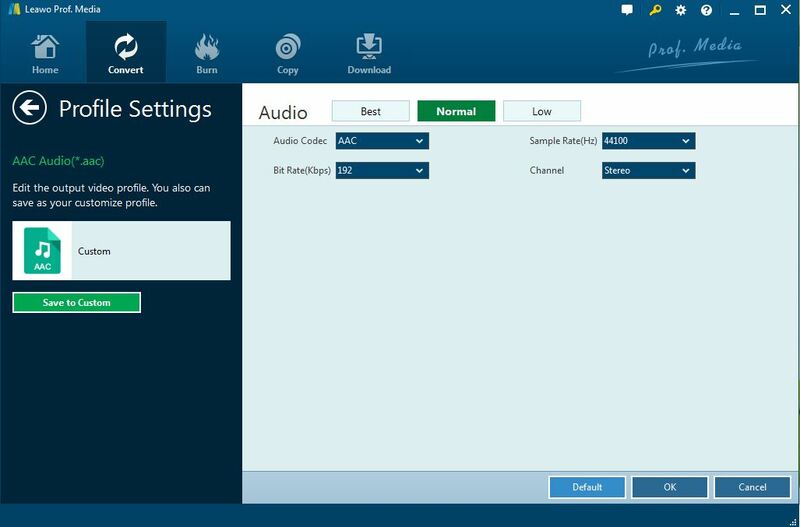 You can download and install this converter in your PC, then launch it and follow the straightforward guide. When the source files added, open the drop-down box next to the big green “Convert” button and then click the “Change” button to enter the “Profile” panel. Then select AAC as output format here. Locate the target format AAC by entering key words on the quick search box on the left pane. You are able to set audio parameters for the output AAC file. You can go to the drop-down box again and click “Edit” option to enter the “Profile Settings” interface to adjust audio parameters of selected output profile, including Audio Codec, Quality, Bit Rate, Sample Rate, Channels, etc. When all the settings done, you can click the big green button “Convert” in the main interface. Then a sidebar will pop up where you are required to set a directory for containing the output AAC file. After setting the directory, you click the “Convert” button at the bottom of the sidebar to start converting the MP3 file to AAC. It will be done fast in minutes. Now with the iTunes M4B audiobook to AAC converter, you have got the AAC files from the iTunes DRM-protected Audiobooks in simple steps in several minutes. Now you can play the converted iTunes audible books in AAC on your preferred devices without any limitations. The powerful and professional iTunes DRM audiobook converter mentioned here can help you a lot to convert iTunes audiobook to mp3 for playing on MP3 Player or other Android devices. 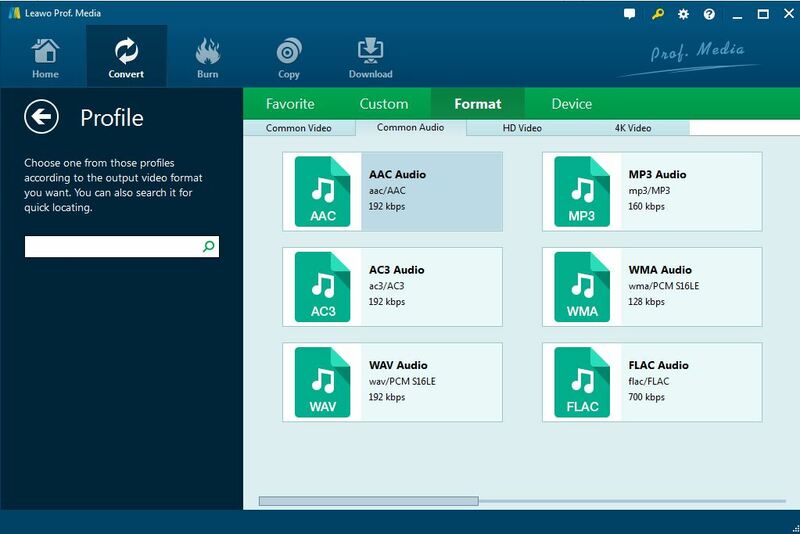 And with Leawo Video Converter, you can convert the MP3 files to AAC or other formats in several easy steps.